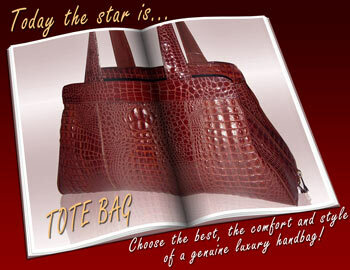 THE TOTE BAG: A COMFORTABLE, ROOMY HANDBAG THAT IS ELEGANT AND STYLISH TOO! EVERY WOMAN'S DREAM COME TRUE!!! Most women are dissatisfied with their handbags, reveal statistics from some recent surveys, saying they're either too small, too unwieldy, and not elegant enough! Is it really such an impossible task to find a comfortable bag that is also stylish??? ........... It doesn't have to be!!! So don't settle for a regular bag that is merely good enough. Go out and choose the best, the comfort and style of a genuine luxury handbag; and for practicality and elegance you can't beat a tote bag. The handbag today is no longer seen just as a luxury item, to dress up an elegant outfit or to show off and accentuate your look: it has become an indispensable accessory for every woman, kept close at hand and relied on every moment of the day. A comfortable bag is an intrinsic part of a woman and her daily life; it is to her handbag that she entrusts everything that she needs to maintain her carefullly groomed, stylish image, her personal box of tricks that means she can still appear fresh and dynamic even after hours of stressful work. Once upon a time most woman were housewives and only went out rarely, to go shopping at the local market, or for Sunday outings with their husbands. Their life was mostly contained within the walls of their houses and everything they needed during the day was there, right to hand. Thanks to progress, the cultural evolution of the last fifty years and above all to the high-powered roles that women have deservedly carved out for themselves in today's society, their lives have radically changed and, as their lives have changed, so have their needs. A woman today spends very few hours of her day at home in domestic activity; she has her work, social life and her other interests that may well take her away from home all day long. Even mothers of small children are often out and about in a whirl of play dates, baby massage and toddler activities for a good part of the day. A successful woman is expected to be neat, elegantly dressed and made-up, a subtle hint of her signature scent perhaps, as her life is much more eventful and active than in the past. Her work and every day life bring her into contact with many other people, for work lunches and conferences, where it is not just her professional ability that counts, but also her polished, professional image. A handbag becomes far more to her than just an accessory to adorn and enhance her look. It is a portable home from home, a treasure chest where she can keep to hand everything she needs to be faultlessly impeccable under any circumstances, from toothbrush to evening make-up for a sophisticated soiree. This is why today's woman needs a handbag that is more than just elegant and stylish, it must also be roomy and practical, designed to take not just her wallet and house keys but every single ingredient of her daily life. With this modern woman in mind, and the diversity of her innumerable committments, it has been designed a range of elegant tote bags that are generously proportioned and comfortable to carry. They flatter the female form without losing any of the practicality and comfort that you look for in a bag for every day. These exotic tote bags have been designed with various compartments, to allow you to organize your things effectively, and find exactly what you need quickly and efficiently. Each tote bag also has several internal pockets, some with zip fastenings, some with press studs. Our tote bags have long handles that make them comfortable to wear and some are embellished with strass crystals or pendants that give an extra touch of glamor and sparkle. Each of our bags has been skillfully hand-crafted by our experienced Italian artisans, who spend days, sometimes even whole weeks, to make an exclusive and practical handbag, that will immediately become part of you from the moment you first tuck it under your arm. This is what some women think when they are looking at our exotic leather tote bags: they completely fall in love with the feel and looks of our bags, but worry that it would be a waste to spend so much on a bag for every day, a bag that will inevitably have to take a fair weight in it and is bound to have to stand up to any amount of wear and tear. We'd like to reassure you that this worry is completely unjustified. Natural leather bags, especially the larger designs such as tote bags, are considerably heavier than the same style of bag made from python, for example! Exotic leather handbags, especially bags made from genuine snakeskin, are extremely light, even the larger tote bags and hobos. 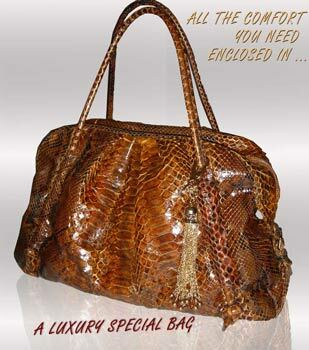 Python skin is also very resiliant and strong and a python tote can happily carry a large amount without protest. The handles, when they are made of python, are much more practical than natural leather ones because python shapes itself to your arm and so makes the bag much more comfortable to wear. Our company offers our clients a huge range of tote bags and other styles of big bag, so that you can select the design that suits your lifestyle, personalising it with your own choice of color and type of leather, to end up with a unique bag that fits your needs exactly. So look no further, if you are a succesful, professional woman! Finally you can have at your side the bag you have been seeking: a bag that guarantees quality, comfort and innate elegance! Give yourself this precious gift and soon you'll feel like a new woman, elegant and comfortable the whole day long, thanks to your top quality, indisputably stylish tote bag, 100% guaranteed by the Gleni brand.